IOWA CITY – Returning to basketball this season has given Missouri forward Cierra Porter a chance to walk in her mother’s footsteps this week. The Tigers’ 6-foot-4 senior is the daughter of former Hawkeye Lisa Becker, whose 1,335 career points at Iowa ranked second on program’s all-time list at the time of her graduation in 1987 and still ranks 19th in the Hawkeye record book. 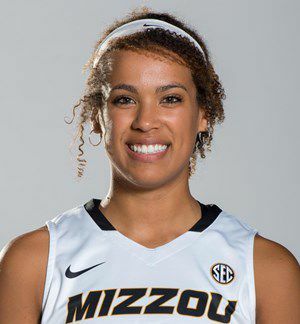 Porter, who is also the niece of Missouri coach Robin Pingeton, almost walked away from the opportunity she has now as the Tigers prepare to face Iowa today in a 1 p.m. second-round match-up in the NCAA women’s basketball tournament. Persistent knee problems that followed an torn anterior cruciate ligament during her freshman season led Porter to decide to retire from the game last June. She was back on the court by the end of December and back in the lineup a month later, currently averaging 7.7 points and five rebounds per game for the Tigers. “It’s been good to be back out there and be part of a team again,’’ Porter said. “It’s March. It’s not 100 percent, but it’s March and we’re playing basketball so it feels great,’’ she said. Porter said she hasn’t talked much with her mother about her playing career, arriving at Iowa as a 6-4 forward who earned Miss Basketball honors in Iowa in 1982 after averaging 58.7 points as senior while playing the 6-on-6 game at Cedar Rapids Jefferson. Priority one: Iowa’s plan against Missouri starts with taking better care of the basketball. The Hawkeyes turned the ball over a season-high 24 times in Friday’s opening-round win over Mercer and cleaning that up is something Iowa knows it must deal with if it hopes to advance to the Sweet 16 for the first time since 2015. Missouri forces an average of 12.4 turnovers per game. Survivor: Second-seeded Iowa and seventh-seeded Missouri both advanced following close calls in the opening round Friday, the Hawkeyes beating Mercer by five points and the Tigers needing overtime to get past Drake by one point. Pingeton doesn’t believe the thin margins will impact today’s game. Last chance: As of midday Saturday, Iowa had sold 9,800 tickets for today’s game which will be the final Carver-Hawkeye Arena appearance for what Bluder labels “a special group’’ of three seniors. Tania Davis, Megan Gustafson and Hannah Stewart will take the court at home one final time, looking to add one last win to the 16 the Hawkeyes have collected there in as many games this season. Work detail: Pingeton and Bluder are downplaying their ties that began at St. Ambrose where Pingeton played on Bluder-coached teams that reached the NAIA Final Four in 1989 and 1990. Pingeton does find it different coaching against mentors. “Probably none of us really like it, but at the same time I think as a coach you get so lost in your prep and your scout that with time you’re not ever thinking about those things,’’ Pingeton said. Bee hive: Pingeton, in her ninth season as Missouri’s coach, isn’t the only member of the Tigers staff with ties to the St. Ambrose women’s basketball program. Jenny (DeSmet) Putnam, a 1997 Rock Island Alleman graduate who like Pingeton was an all-American in basketball and softball for the Bees, is in her ninth season as an assistant coach at Missouri. Putnam was the leading rebounder on the last of Pingeton’s eight St. Ambrose teams during the 1998-99 season, a 30-7 team which reached the Elite Eight in the NAIA Championships. A record day: Iowa post player Megan Gustafson established a new NCAA Division I tournament record by hitting her first 13 shots in Friday’s 66-61 opening round victory over Mercer, part of a 14-of-16 effort from the field that also set a Division I tourney record. Gustafson, who recorded her 13th game of 30 or more points this season in the victory, was named Friday as one of four finalists for the Naismith Trophy presented by the Atlanta Tipoff Club to the top player in college women’s basketball. Louisville’s Asia Durr, Oregon’s Sabrina Ionescu and Notre Dame’s Arike Ogunbowale were also named finalists for the honor which has never been won by a Big Ten player.